Considered the Rolls Royce of benches, Jansen products have been manufactured in the USA with great care for over 60 years. They are 'Benchmakers' to Steinway, Baldwin & Kawai, because their exceptional quality begins with superior materials. Each bench is made of carefully selected solid Maple Hardwood and they use only the finest Leathers & Vinyls for their bench tops. 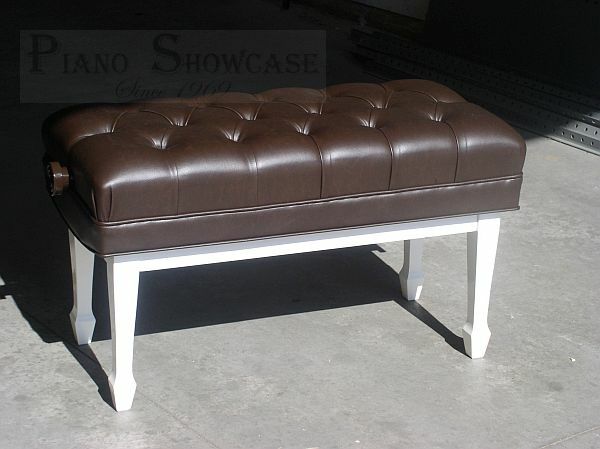 Available with a choice of 9 hand carved leg styles, with either a Vinyl or Leather "Diamond Tufted" top. Wood Finish - Satin or High Polish finish. Seat size - 33" x 16-1/2"
Height adjustment from 18" to 21"
We can substitute special length legs either 1 or 2 inches higher or lower on the following 3 leg styles. 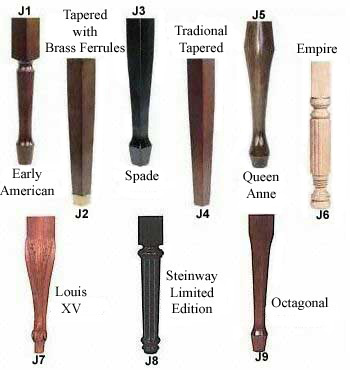 9 Solid Maple Hand Carved leg styles. Price varies according to leg style selected. Please note: - The following benches are Custom-Made and may take longer for delivery. The products manufactured by Paul Jansen & Son Inc are warranted for a period of one (1) year against any manufacturing defects. Excluded from warranty coverage: Normal wear and tear, misuse, damaged caused by user. They will repair or replace at their option. Any transportation costs are the responsibility of the customer. 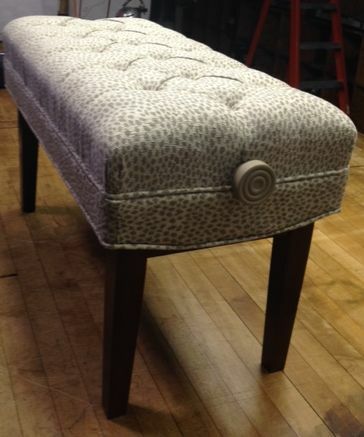 Match your bench to a fabric of your choosing. We love it. Color of wood , leather etc. and quality are excellent. It is quite firm compared to our previous bench- the bench we could no longer sit on for long because the edge bothered our legs. I am sure it will not become more firm with time. I honestly have no suggestions for improvement. Customer service was impeccable, & worthy of special mention. We paid a lot, but got what we paid for. 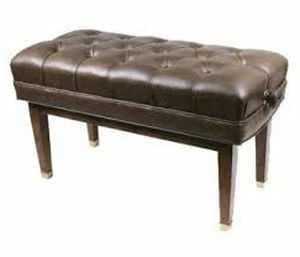 Playing the piano for the last few years has been difficult because our original piano bench aggravated my low back pain. I am beyond delighted with our beautiful Jansen bench. The adjustable height and tufted leather seat have brought comfort, ease, and pleasure back to practice. I wish we had purchased this bench long ago...very highly recommended! Customer service also receives high marks. So it's a piano bench. And 'way more expensive than anyone would think reasonable. But I got tired of struggling with an old bench that had become wobbly after 20+ years and went for this one. Duet rather than standard just for comfort. It's solid, well machined and very nicely finished. Kelly on the phone made the process painless, with the best price I'd found and delivery a few days later. I received my new bench in black leather. I was replacing a single Jansen bench sold to help defray the cost. I will agree with the statement of others, you get what you pay for. The bench arrived quickly, securely packaged. Spade J3 legs, black satin finish, and of course the diamond tufted leather top. 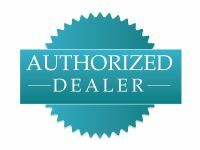 Vanda King provided excellent service and a great price. This a great bench. Thanks Vanda! We purchased a grand piano for my two girls to learn to play on. The piano came with a bench. It was brought to my attention that playing for 4 hours on the stock bench required the player to premedicate themselves. I couldnâ€™t decide between the small bench and the duet. The duet is perfect, beautiful, comfortable and not hard to move back and forth. 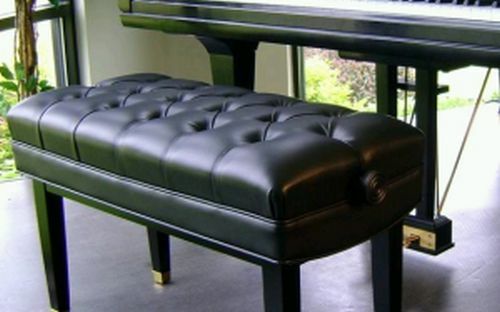 Every Grand piano should have this bench!